Hua Tuo can discard one card of each suit and choose a player that has already died. This person comes back to life with one health and draws cards equal to their health limit. 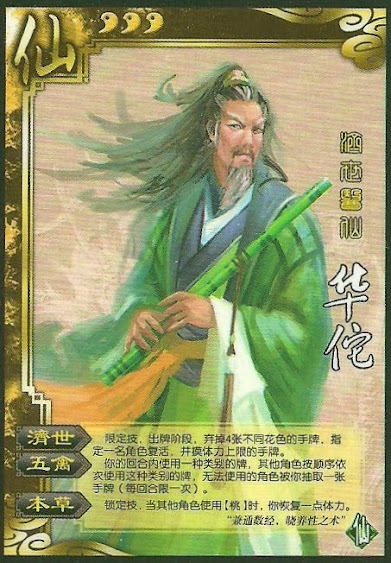 Once per turn, Hua Tuo can use a card and make all other players use the same card. If they cannot, Hua Tuo takes a card from them. Whenever any player uses a peach, Hua Tuo recovers one health. Hua Tuo can use "Five Birds" for any card that he uses. Other players then have to use a card that is the same. This means that if Hua Tuo uses a Blaze, then every other player must use a Blaze or Hua Tuo will take a card from them. If Hua Tuo uses a Fire Attack, players must then use that. Other types of attacks are not acceptable. If players do in fact use cards in response to Hua Tuo's "Five Birds", these cards all take effect in the normal order. When a player is resurrected they keep the same general and role that they had before in the game. No matter how much damage they took when they died, they are restored to one health. When they return, they are in their default starting positions, they are not in Chains nor are the flipped, even if they died that way. They lost all their equipment and cards when they died, so the cards they draw will be the only cards they have. They also will not have any pending judgment cards on them since these would be lost when they died. If the character uses any tokens of any sort these are all discarded when they die. This means that they are starting over from scratch when they are revived. Hua Tuo cannot benefit from "Herbal Medicine" if he is at full health.